Develop complex 'if-then' and 'what if' scenarios to develop, evaluate, & back-test your investment strategies with NEW MarketBrowser AE Conditional Analytics™—all for only $29.95 per month! What are They & How Do They Help Me? Check out the example below to see how we back-test a potential trade strategy. This entire analysis takes only moments to build as MarketBrowser AE's unique, new, menu-driven conditional analytics™ make evaluating decisions quick & easy! Final Analysis (above): Here are the final results of back-testing a potential trade strategy targeting google. Below is a step-by-step breakdown which shows how we used simple MarketBrowser AE tools to create this analysis in 6 steps. W1 - Google Volatility: Here we've charted Google's Stock Price in green and then used the technical study menu to over-lay its volatility index (with a boxcar of 6) in the cyan line below it. W2 - Selling Rule: In Window 2 we chart our conditional sell signals. In this example we sell on days when the current price is greater than yesterday's price plus 1/2 the volatility index. W3 - Buying Rule: Here we've charted our conditional buy signals. Each bar marks a day when our buy rule is triggered (current price is less than yesterday's price minus 1/2 the volatility index). W4 - Profits/Losses: Now things are getting interesting! 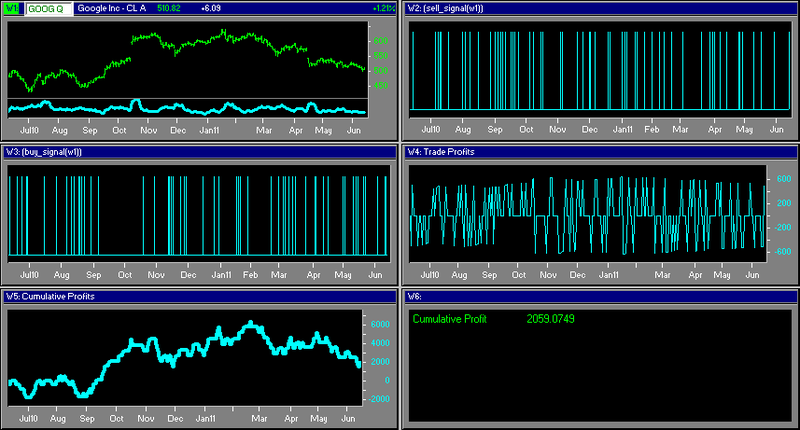 Window 4 pulls & charts profits and losses for the Sells triggered by Window 2 and the Buys triggered by Window 3. W5 - Cumulative Profit: Here's the payoff. In Window 5 we total the individual trade results to generate a running total for the cumulative profit and losses over time that would have resulted from our potential trade strategy. W6 - mSheet™ Investment Scorebox: Here we're using MarketBrowser AE's mSheet™ to pull a current (LIVE) result from Window 5 ($2059 cumulative profit!). This number will update as data changes. Note: although we're tracking only 1 number here, mSheet can hold hundreds of live stats at a time! Read more about mSheet here! Final Display - Live Back-Test Analysis! Final Display: Keep it all on a single display. Your complete back-test analysis—with automatically updating charts & analysis—all fits into a single desktop display! Back-Test with Conditional Analytics™ & More - Order AE Today! Read more about MarketBrowser AE's Advanced Conditional Analytics here!